Thanks to your diligent voting efforts and your support, I placed first in Babble.com’s popular vote by at least 600 votes! Below is the screenshot I grabbed of the contest because I was so excited about how well we were doing in the polls thanks to you support. And while, despite this, I didn’t place first in their top 100 as we thought would happen (I was placed at #99), it is still cool that Your Lighter Side placed in the Top 100 for being a site still growing and catering to people who follow a more restrictive diet. Congratulations! You are a Readers’ Choice Mom Food Blogger for 2011! 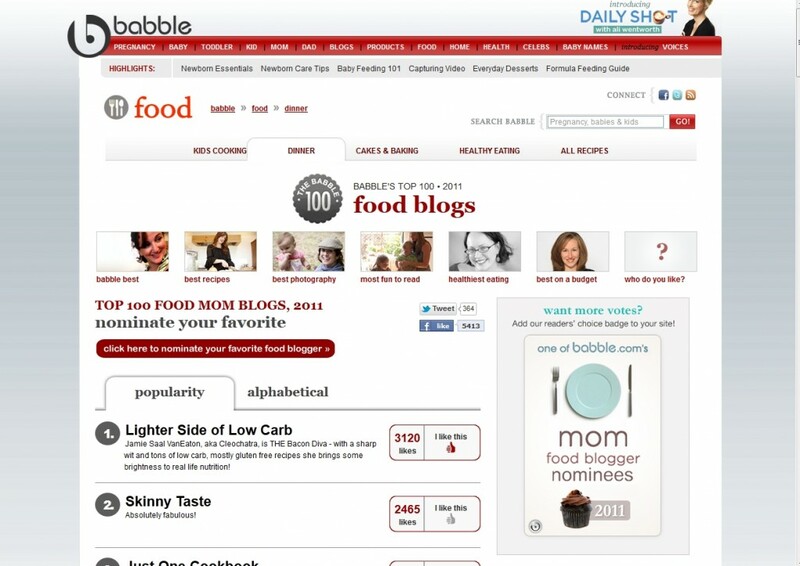 Your blog has been nominated by the public as a supplement to our Top 100 Mom Food Blog list. Clearly your blog is a fan favorite when it comes to the best family-friendly recipes on the web, and we are so happy to recognize your achievements! It sounded like a popular vote deal to me, so I pushed the vote. Thankfully, my friend Scott asked Babble what was up today. It was very nice of Andrea to write back so quickly and let us know what was happening. What’s cooler is that you were here along with me, pushing to get the word out to a nation of people fighting diabesity! Unfortunately, it wasn’t just my site that took a hit, so I don’t feel the low rating was necessarily a mark against diabetes-based sites. Skinny Taste ended up in the high 60’s, even though she came in second in the polls (see above). Long story short, we made a showing in the polls and I have the best friends, followers and readers on the freaky deak planet! Your support over these last five years has been tremendous, and we’re not about to slow down any time soon. I’m celebrating my site’s fifth anniversary! I am working a blueberry buckle recipe I hope I’ll be able to share this week. I have giveaways, goodies and more for you starting next week to celebrate my 5 year Site-a-versary so stay tuned! Thanks again for your support! You guys truly rock it out. Your blog is #1 with me! It’s the only blog I actually follow…I might visit others occasionally but your blog is the standard that all others should meet, in my opinion. Congrats on the 5 years! that’s amazing! I’m so proud to be along for the ride. Thanks so much for your very generous compliment, Deborah, and than you for the 5 year woohoo. I am really excited and so happy you’ve been with me for this journey! It’s been a crazy, fun-filled baconpalooza. The reply from Babble.com explains where they get their name. Regardless, you were robbed… I mean 99? I can’t wait to give you free stuff! Am putting that together now. Thanks for the kudos! Hogwash. They just used you bloggers to raise their site traffic, and selected their favorites for the contest REGARDLESS of what the online voters wanted. I will not be giving them any site traffic that is for sure. You are far more gracious than I would have been after being misled and deceived. Amen, April. This is ridiculous.